Andrea Nixon (Steed Bespoke Tailors)... who was this years Rising Star Winner in The 2009 Golden Shears tailoring competition, has been selected along with the other winners to exibit their garments at the world famous Victoria & Albert Musuem (V&A), in London. They're setting up a tailoring studio, where they will be exibiting their work. Also they will be offering advice to anyone that is interested in tailoring and how to restyle and recycle their wardrobe. This is part of the "Restyling and Refashioning" event day, taking place on Saturday, 14th November 2009. 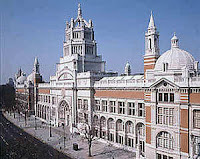 It is being held in the Sackler Centre, of the V&A, be tween 10:30am and 4:00pm, and is free to the genaral public, some activities are ticket. This reinforces what we were discussing in our previous post, with today's society of "Make do and Mend". There are various events taking place throughout the day, including guest speakers advising people on updating their wardrobes. One of the attractions is a major Clothes Swap/Swishing event. This is a new craze which is becoming very popular. The basic idea, is that people take clean, good quality clothes and accessories, which they no longer want, and swap them with people for garments that they do want. There is no money involved and people should go away with new clothes that they really want! On the day Andrea will be exhibiting her jacket and skirt that came third place in the Golden Shears competition, and received the Rising Star Award, March 2009. The competition is organised by The Merchant Taylors Company. Andrea's entry for the contest was completly bespoke, especially since she designed, dyed the yarns and hand wove the cloth for the garments herself. The cloth is made from lambs wool and cotton, so it has a nice soft drape and feel to it, which goes hand in hand with the Steed House Style. The colour of the cloth is rich teal green, which helps give a luxury look to the outfit. The entries were marked on design, cutting, tailoring and style. The judges for the competition included David Furnish, Caryn Franklin, Patrick Grant, Marek Reichman and James Sherwood. In the tailoring studio, Andrea will be able to explain to visitors how she made the pieces from beginning to end. She has step by step photographs showing the process, to make it easier for people to see the development of the making procedure. This will be interesting for people to see as some very complex techniques are involved. As the jacket will also be there on display people will be able to examine the time consuming details that adorn the jacket, such as beading around collar, lapels, and belt, along with the hand dyed silk lining.